For the past three or four years I've used a Day Timer as my office planner, keeping my personal planner (a Quo Vadis) separately. But a local bookstore has been in trouble financially and last week there was a "buy-a-book weekend" to help them out. 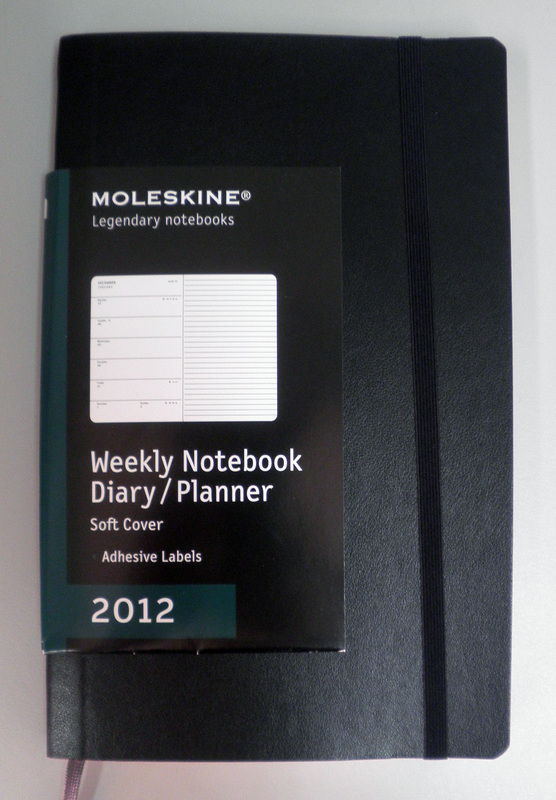 For some reason I just couldn't find any books I wanted to read when I saw the Moleskine section and this Weekly Notebook Diary/Planner in particular. I grabbed it and headed for the check out, feeling both virtuous and organized. 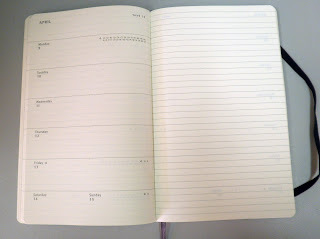 At the front of the Notebook is a Personal Data page that I don't think I would ever fill out in its entirety, especially the financial and credit card data. They want you to put down your number, or just the bank name? So when you lose it your identity theft will go much smoother? Name, address, and phone number will suffice for me, though I am curious about my blood type and should ask my doctor. 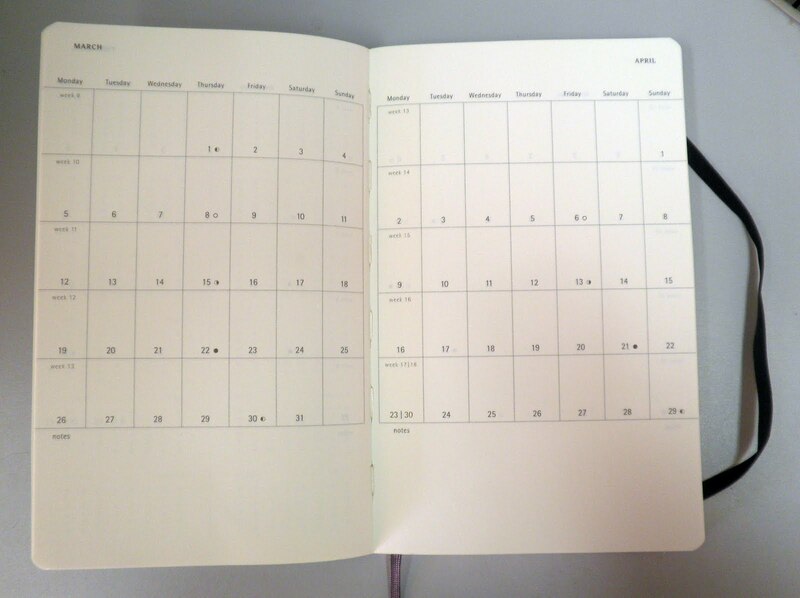 Lots of different information in these Moleskines, with a selection of calendars at the beginning such as this monthly at-a-glance. 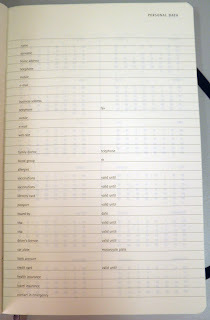 You also get international holidays, measurement equivalents and temperature conversion tables, time zone information, pages for travel plans and memories, and an international sizing chart so you can convert the size of a pair of women's jeans in the US with Great Britain, Denmark, France, and Italy (12, 32,32, 32, 32, and 32 respectively--I look at that and think that one country seems to be marching to its own drummer). 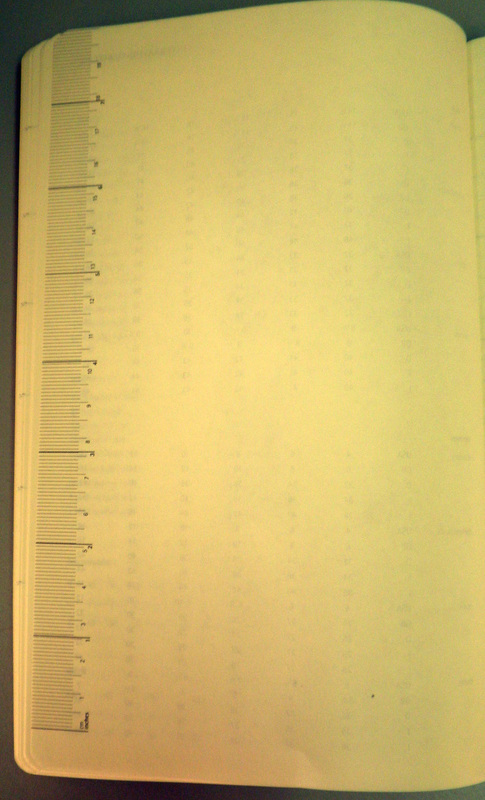 One handy feature is this ruler, for taking approximate measurements. 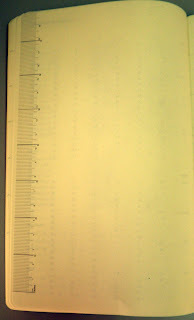 I've found the inside ruler in my Field Notes notebooks very handy when I can't find my tape measure and I want to get an idea of how much knitting I've done or have left. This will also be useful for those times at my desk when I can't find a ruler and need a measurement. This was the main reason I chose the Weekly Notebook Diary/Planner, the right hand lined page where I can make free-hand notes outside of the date. Sometimes I need more space, or just want to write something other than a work schedule. As I don't like writing things that I've done on a Wednesday in the Thursday space, so I wanted a large, basically blank page to use for my weekly jottings. 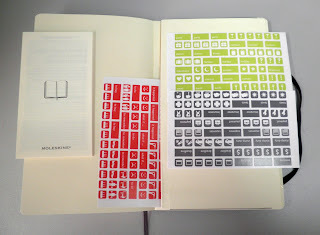 Final picture is of the back of the Moleskine and it's well-known envelope. Included are these sets of adhesive labels for easy reminders of things to do or whatever. I'm looking forward to using this, and glad I could support one of the few remaining (and historic) independent bookstores in Manhattan. Notebookism is back, and has a great review of the Fabriano Boutique Writer's Diary. 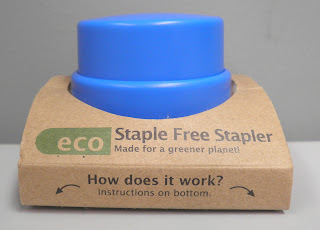 One of the items in my August Lost Crates box was this ECO Staple Free Stapler, whose tag line is "made for a greener planet." I'm not sure I buy the idea that not using staples will make much of a difference, but I'm all for small steps as well as big ideas so it's worth a try out. Made of plastic, the Staple Free Stapler stitches the paper together by creating a rectangular hole and pushing the cut-out paper back and through it makes in the sheets. 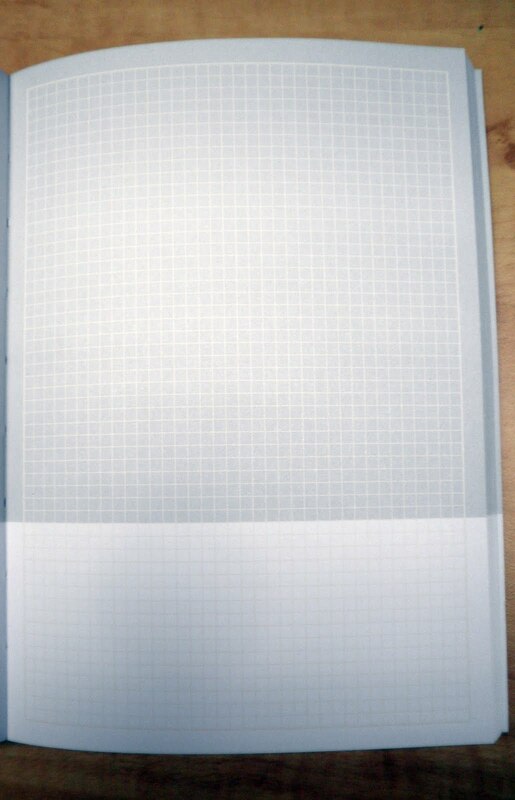 It's a great idea, although not useful for more than 4 sheets of paper at a time. There is no waste paper to clean up, unlike the office 3 hole punch and the tell-tale confetti it leaves behind. On the back the ECO folks have put a handy guide to how this stapler works, both in pictures and words. 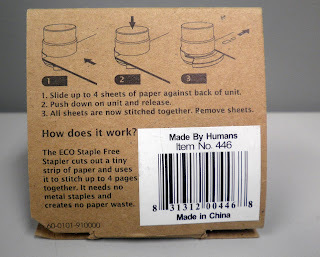 I do think the "Made by Humans" tag on the back of the wrapper might be better placed somewhere than right above the "Made in China" line. The latter begs the question of what type of laborers were used and raises questions in the mind about their working conditions, thus taking away from the warm fuzzies you're supposed to feel using this ecologically-sound stapler. 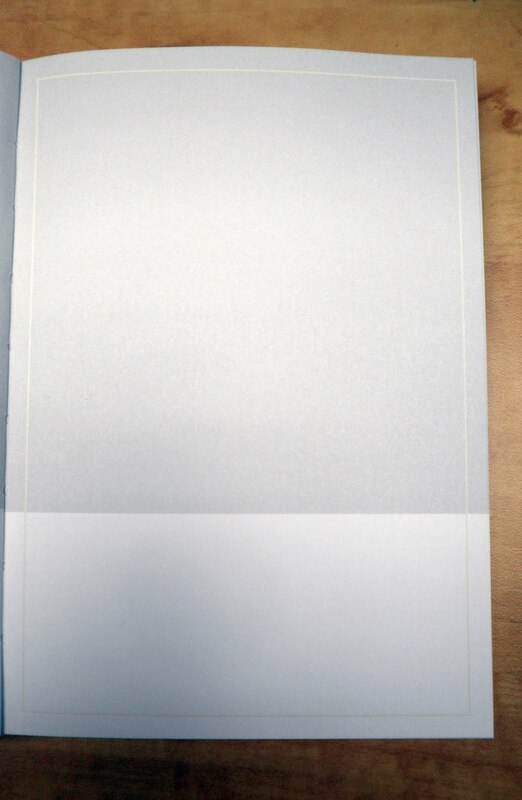 On a corporate level, this makes it partly unworkable if your presentation or whatever is more than 4 pieces of paper. Even Power Point presentations tend to be accompanied by photocopies of the slides, so I'd say this stapler is more for casual use around the office or home than for Board-of-Directors-type meetings. The hole in the pages also makes me thing this might not go over so well for large gatherings: heavy duty photocopiers now have staple options, which is a blessing when you are making 50 copies of a 10 page document. 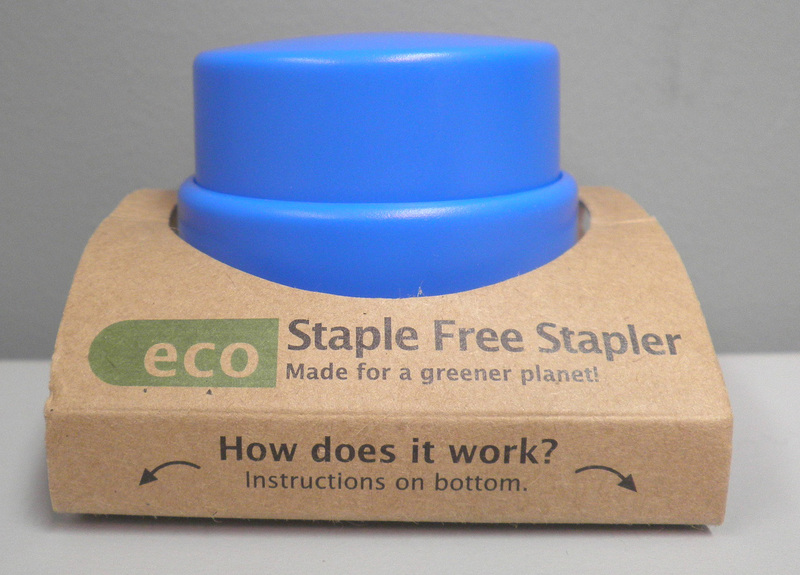 But it's fun and green, so I'd say the ECO Staple Free Stapler would be a great alternative to using metal staples. Saves on having to run out to an office supply place to pick up staples, and eliminates the question of storing all those metal bars for future use (I tend to misplace mine, then have to buy more). Check out Andrew's review of the new Moleskine messenger bag, some great pictures as well. 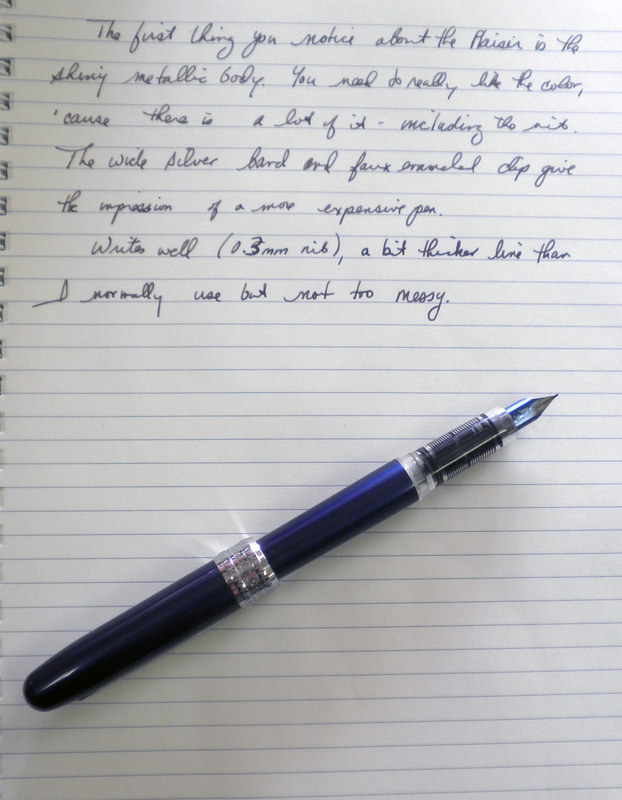 I finally picked up a Platinum Plaisir Fountain Pen some time back, but haven't used it much. 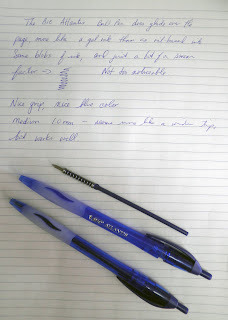 I tend to admire the deep metallic blue color and wide barrel, then reach for another pen to use. I like Platinum fountain pens, and have several that run along the price range spectrum from modest to high end. Reviews have been pretty good, so it's time I gave this my attention. As noted, it's a big pen with a lot of presence. It's nicely weighted, not too heavy but substantial enough. The barrel, cap, nib, and enamel on the clip are all color coordinated, so if you're not fond of the color you've got a lot of it to not be fond of--the blue is quite lovely, but the red has been likened to a giant lipstick. The coating is shiny metallic and scratch-resistant, so I have no worries about putting it in my bag next to my wallet and keys. As for writing, I purchased the o.3mm fine nib; the number is stamped on the nib as well as the Platinum "P" logo, which I love. Comes with cartridges, but no converter. The section is clear plastic, and not entirely sealed. When I was cleaning out some ink from the first usage to see how well it did, water and ink got into the threads inside the section and obliterated any view of the inside area. A minor detail, but one of those "tsk" moments where you wish you could go back 30 seconds or so and undo your action. Perhaps the most important talking point, the cap is specially designed so the ink doesn't dry out or evaporate and clog the nib. I'm tempted to wait a year to test the claim, but I think I'll just keep using it and see how well it writes. So far, I do like this pen and would definitely recommend it to anyone looking for a good starter. One of the September Lost Crates items was this Riviere Fountain Pen by Platinum. It's an interesting pen with lots of pluses and one minus. On the plus side, it's a thing, stylish design. The plastic body and cap are sturdy, but it's a thinner design that I like. The clip is solid looks like it was modeled on the higher-end Reglus with it's stone age point design. Another plus is the nib, which is small and a bit on the squat side. This reminds me of my Parker Latitude nib which I love using. The Platinum "P" logo is on the nib, along with an "M" indicating a Japanese medium point. Not too wide, I like Japanese mediums more than their Western counterparts. Overall, it's a great looking pen. But there is one big minus: the ink pours out of the feed, all over the nib and paper, into the cap, and eventually makes its way onto your fingers and clothes. I don't know if this is because of the cartridge ink, or a flaw in the feed. As far as purchasing, your best bet outside Japan is on eBay. I don't recall seeing them at Kinokuniya, but they might be there hiding behind other pens. But that's the beauty of inexpensive fountain pens, when you are looking for one type another makes itself know to you. I've been using various journals and notebooks for daily record keeping, and when my last one ran out I dug out this Exacompta Nostalgie Journal with Frank Lloyd Wright's May Basket illustration on the leather-like cover. That this is not leather is a tribute to the faux-textile manufacturers everywhere. It looks and feels like leather, while the tan color and saddle-stitch needle work bring to mind a leather journal made from saddle leather. The May Basket design, originally intended for a magazine, is embossed and appears on both the front and the back. Inside you have a brief description of May Basket's original date and purpose as well as Wright's signature. Overall, an impressive cover. 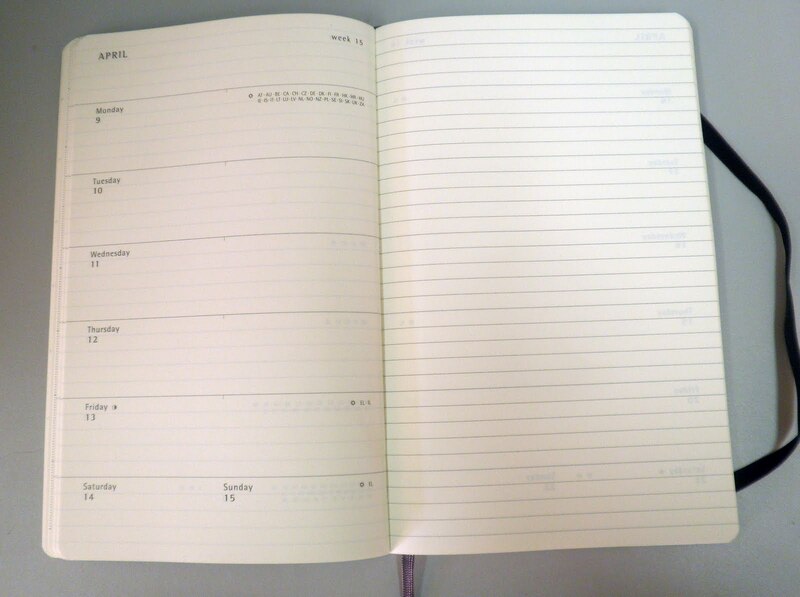 The journal is an Exacompta Basics Forum blank refill, with 200 pages of 64gsm Clairefontaine paper. 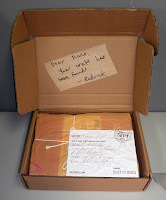 If you are a regular user of the 80-90gsm Clairefontaine and Rhodia papers you will feel the difference in this blank refill's paper right away. It's smooth to write on, but much thinner and easily see through using fountain pen, rollerball gel ink, or ballpoint oil-based ink--but especially the first two. I've been keeping a daily record of my consumption habits, both food and money, to get a better sense of what I'm doing and why. I like the size of the Basics Forum blank refill (4.75 by 6.75, plus a few extra millimeters for the cover), as it gives me the room I want to write out notes as well as accounting. The above, with some details buffed out, is an example of one day in the life ("pigeon" is a notation on an injured pigeon I found outside my building, and took down the street to the guy who raises pigeons hoping he could help--don't know the outcome yet, haven't had the nerve to go back--Schroedinger's Cat, anyone?). But entries can be seen through from day to day, making this a very busy page. On the one hand that's great, as I only have to use one side to mark the page in half (such as above, the line divider shows through on the left page while I've made a line on the right). On the other, I have to read my current writing over my older writing which makes the page seem too busy. All in all this is an excellent cover and a very good refill journal. 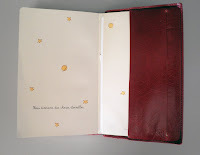 If you're looking for something decorative and functional, check out the Exacompta Nostalgie Journals. 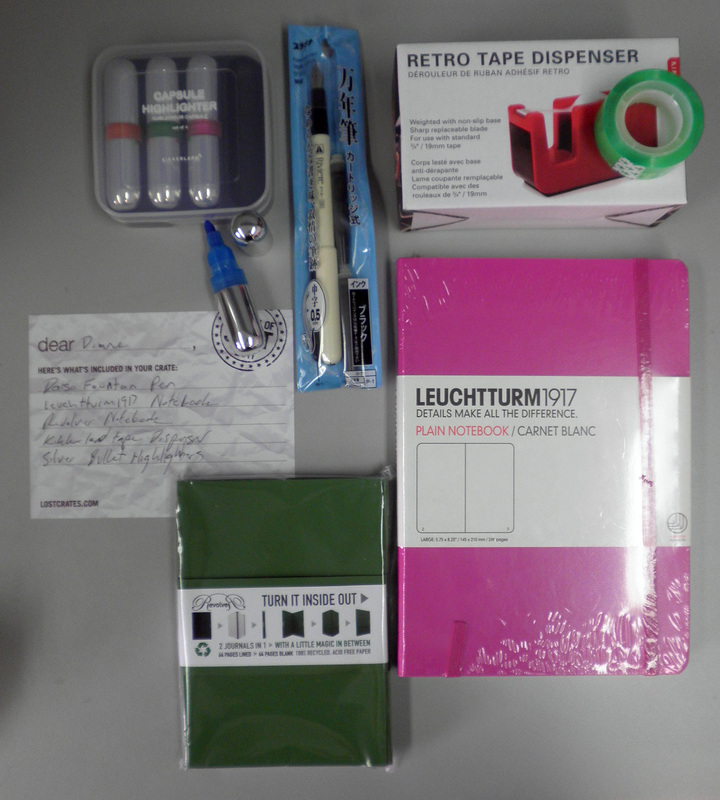 Do go over to Economy Pens and enter the giveaway, lots of great items going to a few lucky somebodies. One of the items in my Lost Crates shipment was this Kikkerland Retro Tape Dispenser in bright red. Along with a neon green tape roll, this stands out on my gray desktop in an eye-catching way. The colors are Christmas-y, although for some reason I think of the Grinch rather than Saint Nick. 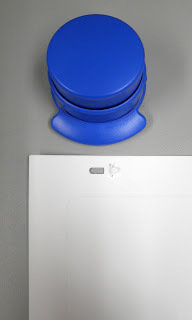 Kikkerland's web site mentions that the dispenser has concrete inside for weight, and an anti slip bottom. Viewed from the side, the rectangular shape and opening remind me of a geometric elephant, where the plastic holding the blade looks like the trunk coming up. The green tape has just enough color to show up against white paper, but not enough to be really noticeable. I could imagine this driving someone crazy, as no one would think that the tape really is green. Next to a standard tape dispenser this really stands out, partly because of the color but definitely because of the design. I'm really enjoying just looking at this colorful addition to my desttop. My September 2011 Lost Crates box arrived, and it's an impressive lot of paper and office supplies that focuses on Kikkerland products. Just one problem with this month's shipment: the box was closed but not sealed. So I have to congratulate the United States Postal Service employees on their restraint, as anyone could have opened it, taken everything, and shipped an empty box. Just a great assortment of products this month, I'll be writing reviews over the next few weeks as I start to use some of these. 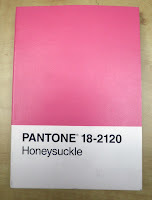 I've enjoyed finding different Pantone stationery and supplies at a few stores, and this caught my eye the other day browsing at Annie's Blue Ribbon General Store (which stocks Field Notes notebooks as well as many other unusual and interesting items): Pantone 18-2120 Honeysuckle journal. 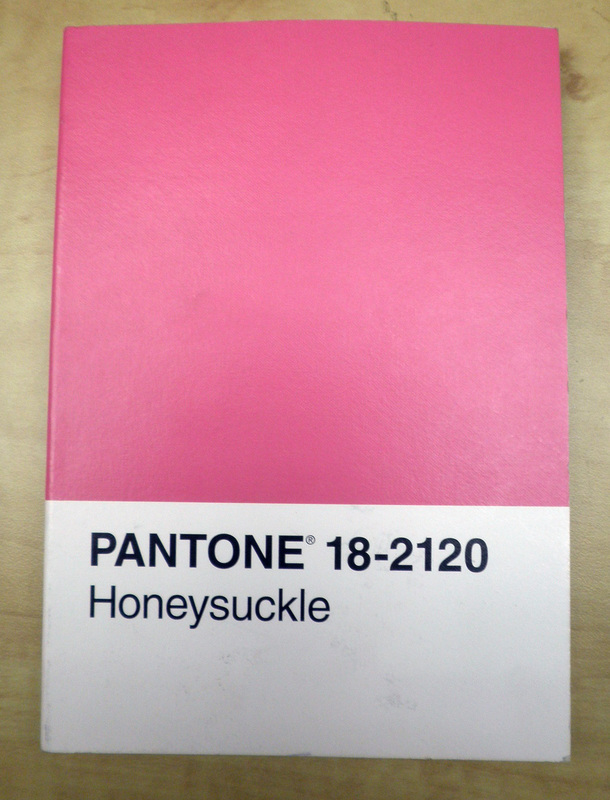 Honeysuckle is the color of the year for 2011, so this journal features the Pantone Honeysuckle color chip wrapping around the front and back covers. The paper is so-so, I haven't tried it yet as I'm waiting for something I really want to keep track of and haven't thought of anything yet. But when I do use it, I'll have a lot of choices inside this one journal: there are four styles of paper, starting with blank sheets, then grid pattern, lined, and dots. The top 2/3rds of the sheet is gray, the bottom third is white, and the lines/grids/dots are in yellow-gold. Not easy to see, but a pretty combination. 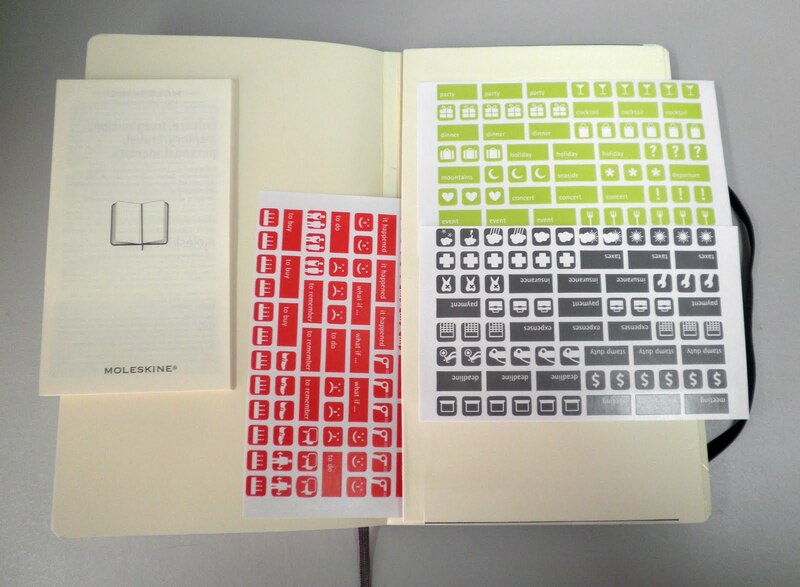 The above pics don't really show the different page styles too well, but it's a really great idea. 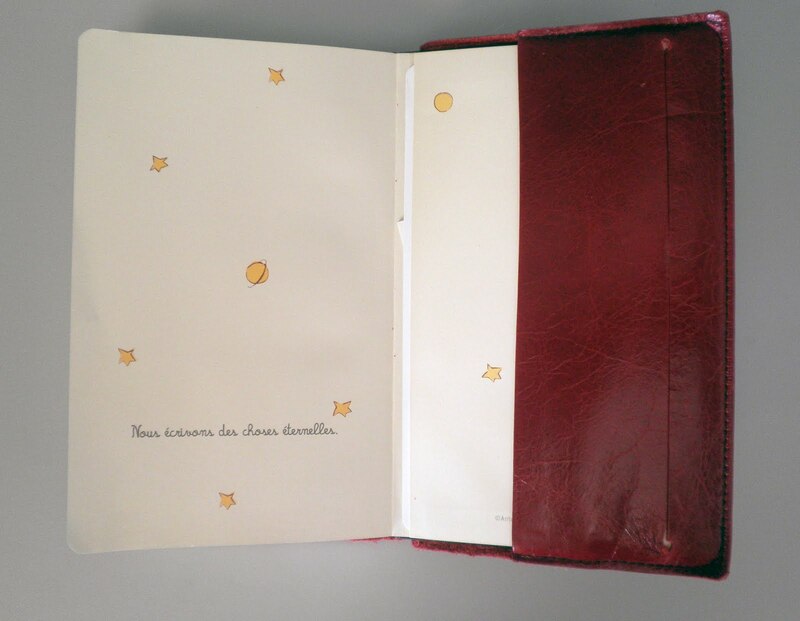 The journal is 5 x 7 inches and 192 pages, so it's bigger than a back pocket but can easily fit in a purse or bag. 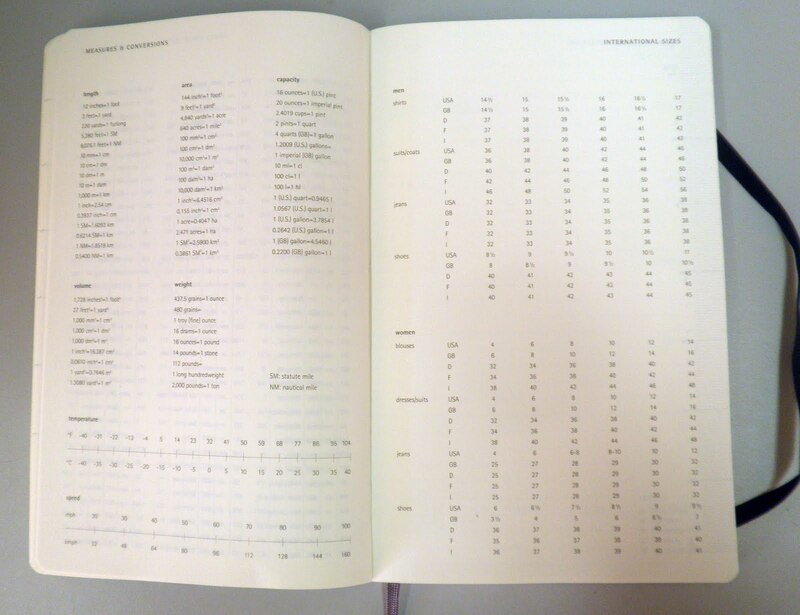 If you're looking for a trendy journal that's got some nice design features, check out Chronicle Books. I love prompts/story starters - this looks like it could be fun! Congrats! Send me an email at diane.fennelATgmail.com with your mailing info and I'll get this out to you in the next few days. Many thanks to Allegra Newman for her guest post and for a copy of her book to give away. My journals travel with me and tend to get beaten up, so I wanted something to keep the cover of my Moleskine Little Prince large journal fresh and new. Renaissance Art makes beautiful leather covers for Moleskine journals and other paper products, such as the Levenger Circa Notebooks, as well as Kindle and Nook covers, photo albums, laptop bags, and more. The sewing is firm and tight, and the back cover has a slit for an elastic band closure to come through if you want to use that to secure your journal. There is no front closure on this cover, while other designs have snaps or ties to keep them closed so using the elastic band is necessary. I'm not fond of the band showing through, and am not particularly concerned about others reading through--it's got all my knitting projects and patterns, as well as noting mistakes and prayers to the Yarn Goddess. 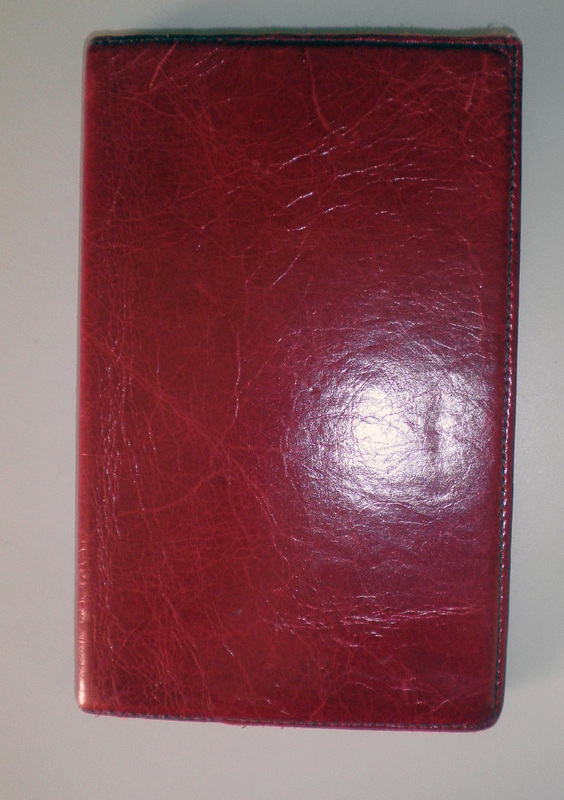 Overall a very good leather cover, and I'll be looking at the smaller Traditional Cover for my Field Notes journals. I'm really excited to have this guest post by Allegra Newman, the author with P.C. 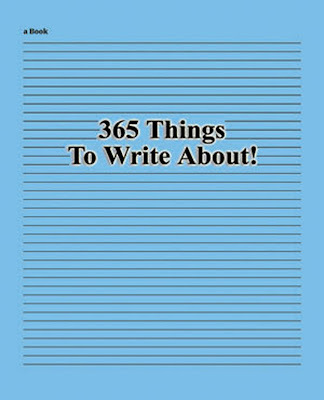 Trauth of 365 Things to Write About. It's a simple system to help you write, and is available in Kindle format. Check out Allegra's website and Facebook page as well for great ideas to write about (jelly wiggles?). Keep reading for the giveaway, I think you'll be very pleased. It gradually disappeared within a year of graduating college. Working a “practical” job didn’t leave many free hours for writing novels and poems, although technically at my job, I was creating stories…from endless hours of camera footage for reality television shows where families traded their wives and husbands or hired famous chefs to revamp their ailing restaurants. Not exactly the quality writing I’d been aiming for when I fantasized about being a writer, but it paid the bills. Unfortunately, journaling also took a backseat to twelve-hour days in edit bays, re-working scenes to be more dramatic. I’ll write tomorrow, I’d assure myself as I tiredly climbed into bed every night. Then the next evening, I would find myself making the same false promise. Let’s just say it is a black-letter day when you realize that you’ve been writing in the same 120-page journal for two and a half years. It becomes even more depressing when a lame attempt to pen ONE descriptive sentence takes SIX hours. It was embarrassing. My vocabulary had dwindled to generic, one-syllable words. In my mind, I could recall a hot, sticky summer in the South, but when I tried to translate that image on paper, my brain drew a big blank. If I was going to write again, I needed a way to jumpstart my creative flow. 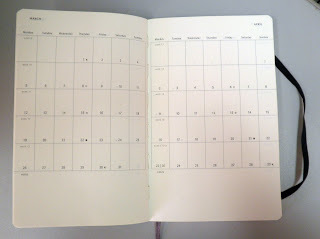 Taking another artist’s advice, I took up journaling again, but this time, I forced myself to get up half an hour earlier every morning to write in a spiral notebook I’d found in the closet. Instead of perusing Huffington Post while I chugged coffee, I made myself fill three pages with whatever was on my mind at 6am. Surprisingly, I usually found I had more to say at that ungodly hour than I ever had when I wrote in the evenings. Journaling got me writing something, but it was a cup of coffee which helped me to come up with a method for challenging myself to write better. One morning while I impatiently waited for the pot to brew, I found myself scrawling almost a page’s worth of words about the scalding, black liquid which would soon fill my favorite ceramic mug. Intrigued, I tried the exercise again the next day and brought my living room to life on paper. And that was my “Eureka!” moment. I thought about the various stories I’ve read in books or watched in movies where everyday objects or places become characters – a garden cultivated by a young girl, a tumultuous climb up Mt. Everest, or a spider that saves a terrific pig from becoming bacon. The smallest things in our lives have the potential to become the greatest stories of all time. Each day since, I’ve challenged myself to write whatever I want about one thing. Instead of laboring over the perfect words to convey a story or poem, I let go and allow the object, person, or place to invoke the scene I set on the page. Are my efforts helping me to write? Well, between May and June, I penned 150 pages of a story which I started eight years ago and never got around to finishing…but it looks like that might be possible now. I can’t say it’s always easy, but I’m having fun and enjoying the art of writing again, which is why I loved doing it in the first place. 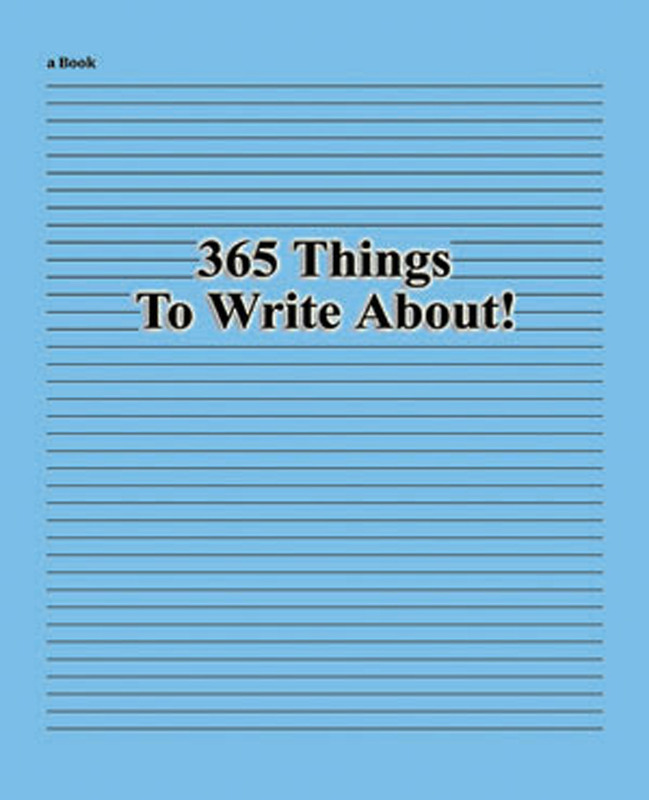 Allegra has donated a copy of 365 Things to Write About for a giveaway at Pocket Blonde, which starts today (Wednesday) with this post and ends Sunday noon EST. I'll pick a random winner using a random number generator, and will post the entry at 5 pm. You'll have one week to get in touch with me to claim your prize (diane.fennelATgmail.com). Shipping will be by media mail. Leave a comment below, a sentence or two on anything that takes your fancy. Comments will be considered numbered by their order (i.e., first comment = 1, second comment = 2, etc.). And while you're enjoying Allegra's post, tell your friends and family to enter the giveaway, stop by Allegra's website and check out her writing, and take a look at her Facebook page. The instruction booklet is printed in 6 or 8 different languages, along with illustrations on how to open the pen and insert the cartridge. There's also a blank strip for you to write your name (or whatever else) and attach it to the pen cap. The Lamy ABC cap, section, and jewel comes in either red or blue, and are block-y so that the pen and cap won't roll off a table. The jewel at the end is pretty big, and won't fit inside the cap so the piece can't be posted. As I'm apt to leave things behind I could easily see myself forgetting the cap, otherwise this is a really cute, really usable pen for children and adults. The nib doesn't leak nor did I have any skipping (although that may be as much a paper factor as the pen). As big as this pen is, it feels comfortable in my hand, and I enjoyed not having to mess around with filling a converter. Just pop in the cartridge and start writing (no dry start on this one, which was nice). The Lamy ABC has the kind of design that gives adults permission to use and enjoy it, a quirky pen that's not really as strange-looking as it may seem. If you're interested in the unusual, check out this pen. This showed up today at my office, a gift from my brother: a Parker Duofold Senior Lucky Curve fountain pen and pencil set in jade green. The barrel imprint is quite good, and is marked "Geo S. Parker Duofold Fountain Pen Janesville, WIS Lucky Curve Pat 4-25-11." The pen was manufactured in the 1920s (1923 to 1927 for this cap band from what I've read), and the barrel shows the ink discoloration typical of this pen. 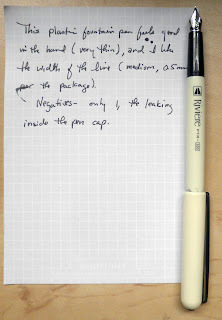 Posted the pen measures about 6.75 inches. And there's a matching pencil for added glam! My brother bought the set and had it totally overhauled by Ron Zorn of Main Street Pens. It's a great looking pen, with just a small crack in the cap that's not really noticeable (pushing down too far when posting it is the likely explanation). I've wanted a Duofold for some time, and getting both a Senior and a Lucky Curve (the nib and filling system, although that may have been switched out) are heaven. Many thanks DFB! 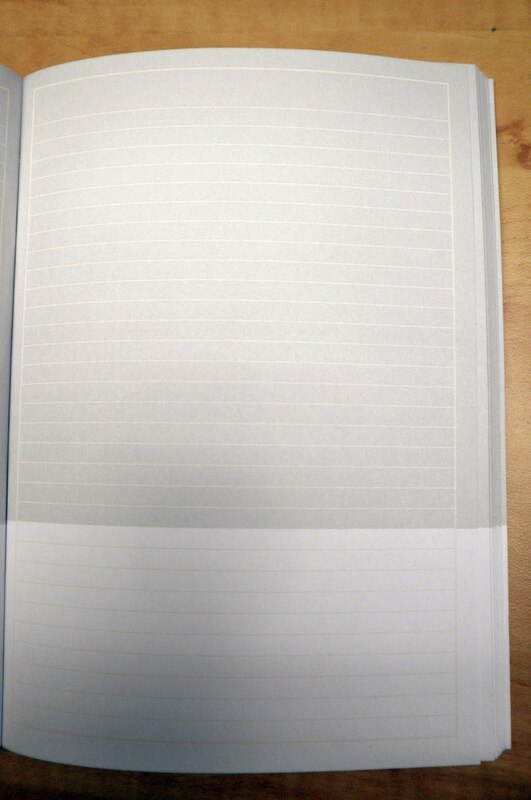 Didn't know this, Muji notebooks come in three flavors: Malt, Corn, and Bamboo. I think I bought this two-pack of BIC ReAction pens for the color combination, black and green (kind of Frankenstein-ish, now that I think about it), more than for a chance to sample the pen. It's one of the BIC Ecolution sustainable development pens, 74% recycled plastic. 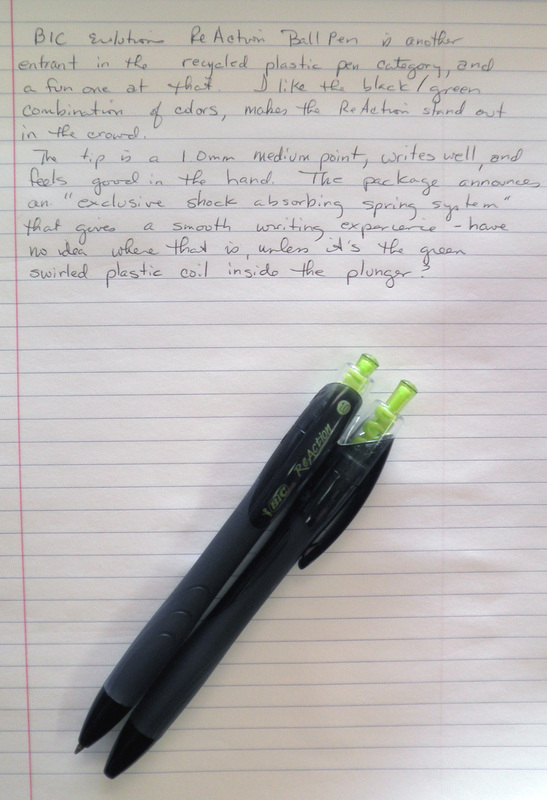 The pen barrel is hard plastic with grip lines. There's a green clear plastic plunger that's very bright, as well as a green swirly plastic piece inside the plunger that is likely the pen's "exclusive shock absorbing spring system" advertised on the packaging. I like the pen's slightly-curved, hourglass silhouette and the use of matte and glossy black as well as green print on the clip. The ReAction has a 1.0mm medium tip, the width isn't too extreme and the ink doesn't seem to smear or blob. Good smooth writing all in all, a great addition to the writing collection.